Due to ship arrival and departure times this tour is NOT suitable for cruise ship passengers. You can now book your all inclusive premium tour to The Giant’s Causeway with Irish Tour Tickets starting 1st March 2018. We are the only company to now exclusively offer guaranteed crossing at The Carrick-A-Rede Rope Bridge! PLUS entrance into the Giant’s Causeway Visitor’s Centre. *National Trust members go free – please choose basic package when booking. 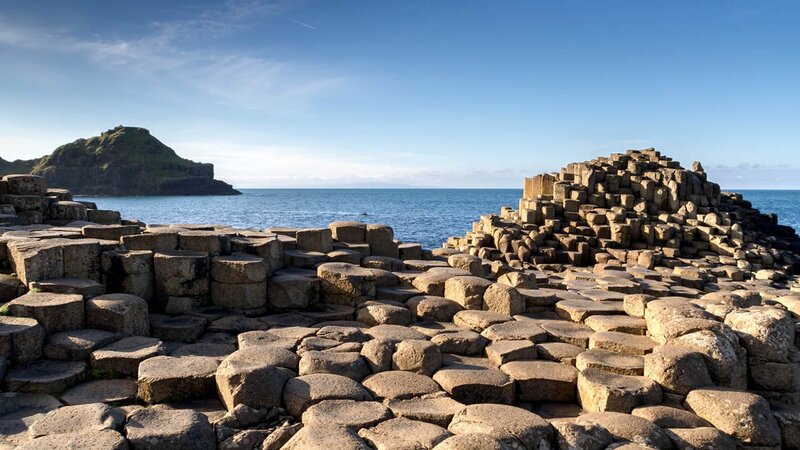 Unlike other tour operators we travel the opposite way to take you straight to the Giants Causeway site before most of the other coach tours arrive. This way you will see the UNESCO listed Giants Causeway first, free from the crowds and queues. We also see several other sites, including the Carrick-a-Rede Rope bridge, Bushmills Whiskey Distillery, Dunluce Castle and more. Our full day Giants Causeway tour from Belfast remains our flagship daily full day tour. Unlike other tour companies we operate all year round! We have years of experience in showing you one of the most beautiful parts of planet Earth in our modern, luxury coaches. Every tour is guided by a fully qualified and passionate guide who will ensure that you are enriched and engaged by your visit. To Book Online choose your date of travel and number of passengers and click the 'Book Now' button. Alternatively you can give our customer services team a call on +44 (0)28 9031 0101. If you have any specific queries about the itinerary just get in touch and we will assist you in any way we can. *Subject to numbers. Please note, if you choose our basic package bridge crossing cannot be guaranteed. Guaranteed crossing included on our premium tours, option to upgrade to crossing (small fee payable) on the day of your tour. *Subject to numbers. There is a lot of walking on what are sometimes uneven surfaces during this tour. Please come dressed appropriately for not only the season, but also for the activity. Our first stop is the Giants Causeway, commonly called ‘the 8th wonder of the world', it is the only world heritage site in Ireland. During our stop here you can spend time climbing over the ancient stones, snapping photos and reflecting on the myths and legends of this very unique area. Entrance to the visitor’s centre is included in the price of both our basic package and premium tours, gaining you access to the café, shop and allowing you to experience the history of the area including an audio guide to enhance your experience. Our next stop of the day is at Bushmills Whiskey Distillery which has been creating beautiful ‘ water of life ‘ since 1608 making this the oldest working distillery in Ireland. Visit this place where family and friends have worked together for generations with the philosophy that hand crafting small batches is the way to create beautifully smooth whiskey. Your stop here allows time for tasting of course! We then make our way to Dunluce Castle for a photo opportunity. This now ruined medieval castle sits perched on the edge of a basalt cliff and is one of the most picturesque castles anywhere in Ireland. After lunch we visit the amazing Carrick a Rede rope bridge – where you can of course cross the bridge which spans a chasm over 75ft in height. The lovely coastal path provides a spectacular walk with stunning sea and cliff views. There is a small charge to cross the bridge for our basic package customers. The Antrim Coast Road is widely agreed to be one of the finest stretches of road anywhere in the world. The road hugs the coast line giving incredible seaside views, passing unspoilt beaches and sheltering under rugged cliffs. You may even see Scotland on a good day! Our second last stop of the day takes us into the picturesque fishing village of Carnlough for a quick comfort break. The village stop is a fitting end to your trip as you take in the quaint harbour used by pleasure boats and small fishing vessels in an area rich for both sea and fresh water angling. Our last stop is at Carrickfergus Castle, situated on the northern shore of Belfast Lough. This Norman Castle, which dates back to 1177, was besieged in turn by the Scots, Irish, English and French for centuries. It remains one of the best preserved medieval structures in Ireland and presents a great opportunity for photographs. All that then remains to be done is to sit back and relax on the comfortable journey back to Belfast in one of our luxury coaches. This really is a must take tour, and with the combination of our luxury coaches, experienced, friendly tour guides, and wonderful attractions, you would be mad to miss it! Please note, on occasion The Carrick-A-Rede Rope bridge may be closed due to inclement weather. In this instance we will provide a guided walk as an alternative.